Note: there is no fee to use our boat ramp. If you believe you should be paying a fee, please check that you’re actually in Waikawa Beach, near Levin. If you’re in Waikawa Bay, Picton, (or any of the other Waikawas around NZ) please contact the local boat ramp owners for information about paying fees. 2005: It has been found necessary to endeavour to have the end of Manga Pirau St by the notice board kerbed and channeled to avoid flooding and the subsequent run off onto the bank where the ramp will be. Consequently this is on hold in the interim. From the March 2005 newsletter. 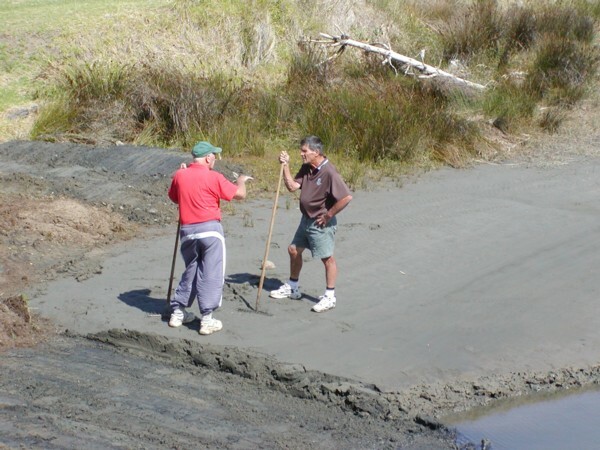 2007: The Association was granted $2000 from the Manakau Medieval Market and it will be used to install a simple ramp by the footbridge to enable canoes and kayaks to have easier access to the river. It will be named Andy’s Ramp as he would have made good use of it! From the April 2007 newsletter. 07 March 2008: Launching kayaks and small boats will soon be a lot easier. Foundation work for ‘Andy’s Ramp’ started today. Russell Archey and his bobcat dug out and shaped the ramp. From The Boat Ramp Takes Shape. 06 May 2008: Andy’s Boat Ramp has regrettably been delayed although the work has begun. The permission we were given to construct the ramp was withdrawn and it now has to get Resource Consent. We are hopeful this will be granted and the work can recommence. 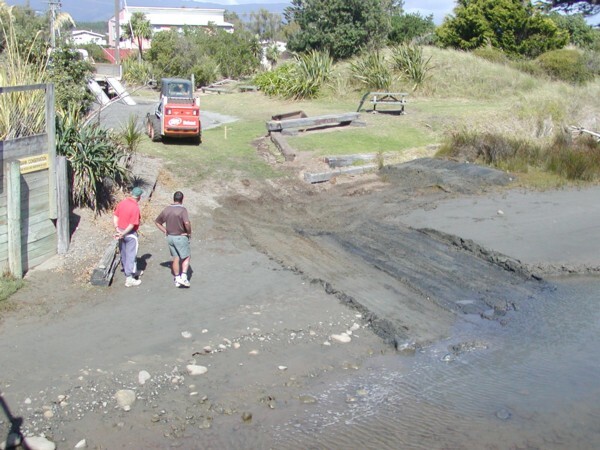 A concrete boat ramp that was laid on Monday 13 October 2008 by three willing volunteers from the Ratepayers Association. It is adjacent to the footbridge at the end of Waikawa Beach Road. 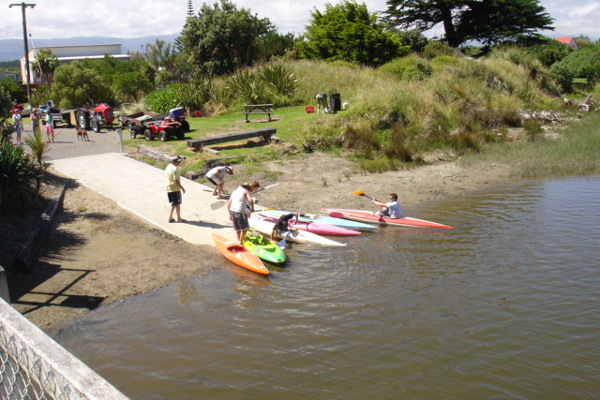 19 October 2008: Resource Consent was granted for Andy’s Boat Ramp, albeit that it took a considerable amount of time. The ramp has been completed and now the bollards that will restrict access for all but canoes and kayaks will be installed. We are sure it will get a lot of use over the summer. There have been several enquiries as to the size of the ramp. It was designed so that a person could walk either side of a canoe, to allow the waka reasonable access and to permit emergencies vehicles if necessary. 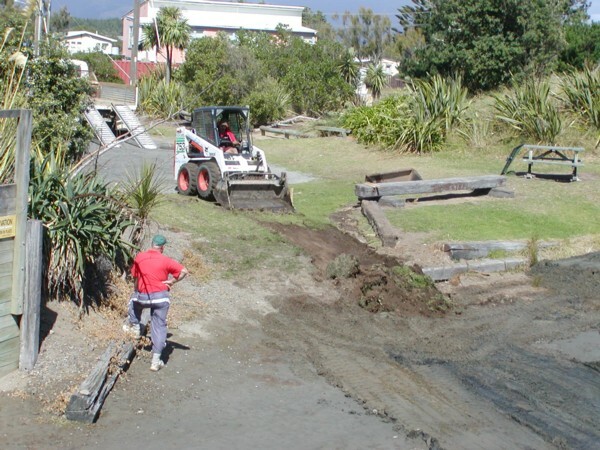 08 February 2009: Graham Hassell’s last big project was the boat launching ramp, the completion of which caused him much frustration because of regional council delays. He finally completed it two months before his death. From: We remember Graham Hassell. 13 May 2009: There have been some enquiries as to the barrier that has been erected on the ramp. This was a condition of the consent required by the Regional Council mainly to stop traffic from inadvertently driving into the stream. After a very successful boat day, a number of people have reported very favourably on the new boat ramp. Access for children finishing races was a great improvement on years past. They no longer have to struggle through a mud bog and then up a steep bank, kayaks were launched with ease and asthetically looked great. 11 January 2011: In the past year since the boat ramp was constructed some people have questioned why the ramp has a locked gate on it. We have reprinted here the Consent which clearly states that the ramp is for pedestrian traffic only and that the gate (which was donated by Richard Hammond) must remain closed. Vehicles will not use this ramp except for emergencies or for specific events. To ensure that there is no vehicle access, four lockable bollards will be fixed to the top of the ramp as well as a sign advising that the ramp is for pedestrian access only. 2. To prohibit vehicle access lockable bollards are to be installed to the top of the ramp, as shown in the amended plan dated 07 July 2008. Note: to read the full Consent visit the link below.